The Interactive room is an ideal proposition for anyone who enjoys technological newbies. It is not without reason it is called a room of the new generation. The players will be amazed not only by the technological solutions and a number of surprising special effects, but also the minimalistic design that goes together brilliantly well with the innovative solutions that have been used while creating the room. Those who like light and sound special effects will surely have a great time in this room. The daredevils that will decide to escape from the Interactive room will have a chance to join the intergalactic squad guarding the safety and order of the whole Galaxy. This is an extremely responsible task. That’s why a 60 minutes long test, which is the game in the Interactive room, can’t be a piece of cake. The teams that will manage to take the test will join the Star Fleet, an organisation that is responsible for the safety of the whole humankind. In the room that is a secret base situated in the universe, the candidates for intergalactic defenders will be put to a test for the last time. After passing the test with flying colours they will start to guard the order and safety in the whole Galaxy. 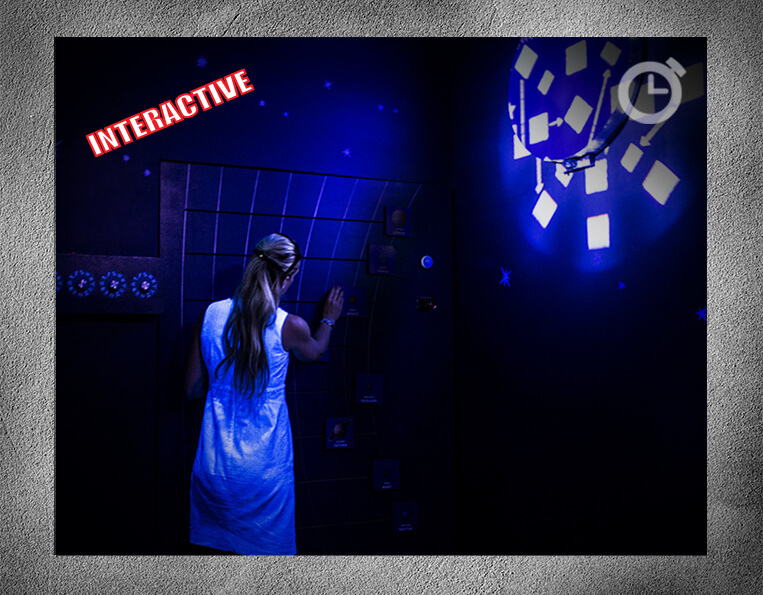 While solving the riddles in the Interactive room, the guests have to first and foremost cooperate. This room is an ideal way to test who can work in a team, get involved and give up individual distinction for a common goal. The prize is not something ordinary either: everyone who manages to solve the prepared riddles will play a huge part in protecting our Galaxy. Let us point out, however, that this success can only be achieved through cooperation, communicating with the other members of the team and prioritising the common goal. The skills that will be important for each individual member will be the ones of logical and creative thinking, good memory and mobility. The ability to work under the pressure of time will also come in handy – the time to solve the test is only 60 minutes after all! You will also have to remember to communicate with each other all the time. The road to success is full of communication and consultations with different members of the team. The riddles have been prepared in a way that will check interdisciplinary competence of the candidates for the Galaxy’s defenders. It is worth remembering that the Interactive room might be your only chance for seeing how the future looks like. This room outruns time but at the same time doesn’t forget about the tradition of escape rooms. The Interactive room is a unique combination of innovation and the old style that has been the reason of the players’ amazement for many years.